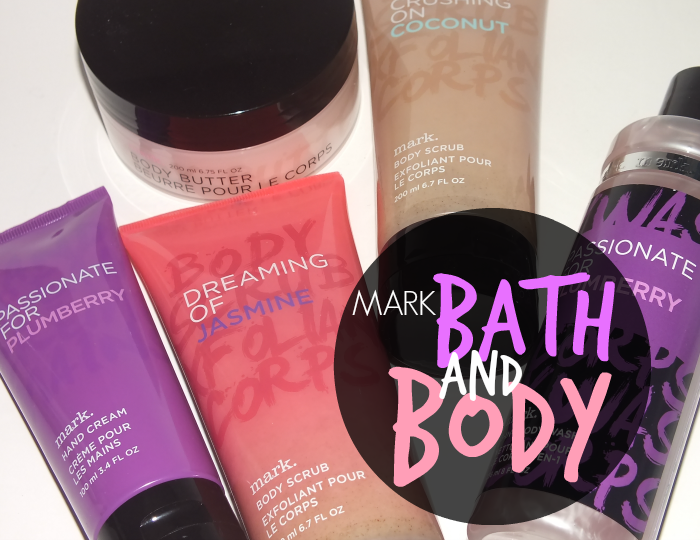 Mark has had a range of bath and body products for a while now, but recently they've changed up their packaging- changed some formulas too, and added a new addition to the line up for good measure. Hurrah for new bath and body goodies! Read on for the full rundown! 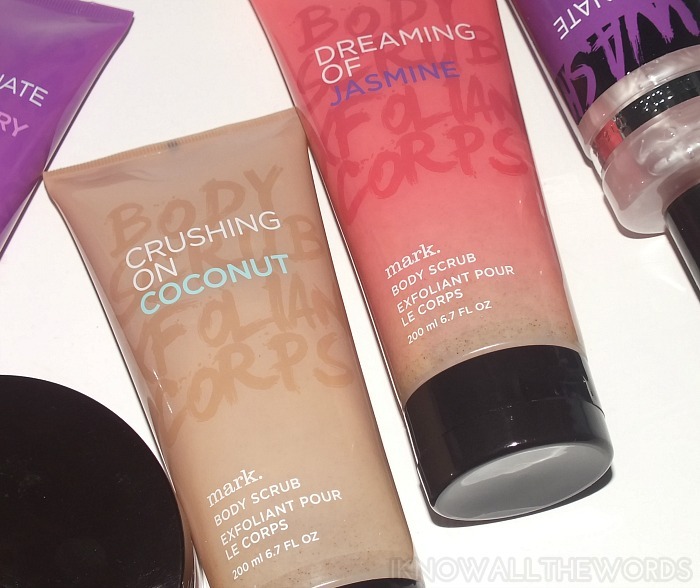 First up, the new addition- Body Scrub! I love a good body scrub, and the new Mark Body Scrubs are perfect for getting scrubby and clean as they cleanse and exfoliate all in one. As they are a two-for-one jobby, I don't find the formula to feel really scrubby (it used walnut shell powder as it's exfoliant), but it does work well to gently exfoliate skin and leaves it smooth, soft, and cleansed. The entire Mark. bath and body range is available in four scents- Sweet on Lemon Sugar, Passionate for Plumberry, Crushing on Coconut and Dreaming of Jasmine. I used the body scrub in Crushing on Coconut, which has a sweet, creamy coconut scent with a hint of mandarin and fresh orchids, which gives the scent a bit of a tangy-floral twist. The coconut scent is very realistic- no fake plastic scent here- but that little bit different than a straight up coconut scent. I also tried the Dreaming of Jasmine scent, which is a blend of jasmine petals, peach and vanilla. The scent is really nice, as it's not strictly floral- the peach adds a nice fruity sweetness- but still has jasmine at the forefront. The already existing items- 3-in-1 Body Wash, Body Butter, Hand Cream, and Body Mist- in the Mark. bath and body range got a little makeover, in that they now come in new packaging. Gone are the tall square bottles for the body wash and body mist, with new round bottles with silver detailing. The Body Butter and Hand Cream packing is pretty much the same, save for the new logo, but the Body Butter also got a new formula. More on that in a moment. I was sent a few of the Passionate for Plumberry items, which smell amazing! I've tried most of the scents in the range (listed above- I happen to LOVE the lemon scent) but hadn't tried this one. It's a mostly fruity scent, with a hint of floral, that's a bit sweet, but not too sweet and quite fresh. For specifics, it's a blend of succulent plum, blackberry blossom, and passion flower. I found the scent to be the strongest, and longest lasting, in the body butter. As I mentioned, the body butter got a re-vamp and is now a really thick, buttery product compared to the lotion like texture it had originally. The new formula is totally decadent feeling, and moisturizes really well. It's amazing on dry skin and will be something I'll reach for quite often as soon as the weather cools. Of course you can layer up with the body mist and shower gel- which lathers really nicely and can even be used as shampoo and bubble bath- and pop on the hand cream mid-day for an added pick me up. The hand cream isn't the fastest to absorb, and does leave hands a little slippy for a few minutes, but it's really hydrating and again, smells pretty great. Overall, some great products! I really love the new body scrub, especially since it cleanses too- got to love a time saver every now and then. Have you tired any of these products? Want to? Thoughts?